I Make Cheese: Best Ricotta Yet! While my first attempt at Swiss (post on that coming soon) is still in the press, I whipped up a batch of Ricotta with the leftover whey. Hoping to increase the yield, I added a pint of heavy cream directly to the pot of whey. After bringing the mixture up to 200 degrees, I added 1/8 cup Apple Cider Vinegar to be sure to curdle the cream. Let it sit for 5 minutes, then ladled it into a colander lined with butter muslin. Hung it to drain for 45 minutes, then mixed in a teaspoon of salt. The result? Light, fluffy, buttery, and absolutely delicious! Yield was a little over 2 cups. Without the cream, it would have been about 3/4 cup at most, and not nearly as amazing a texture. 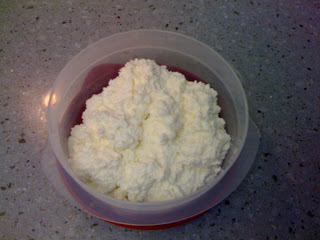 Last time I made Whey Ricotta, I used a quart of whole milk instead of the heavy cream. The yield was about the same, but it wasn't nearly as indulgent. Also, I used 1/4 cup of vinegar (as per the recipe), and the flavor was too strong in the final cheese... hence cutting that in half this time. I absolutely love the idea that ricotta can be made with leftover whey! When I finally feel comfortable with mozzarella I'm going to have to try that. Sounds like it's worth it as well! I haven't had much luck with whey ricotta but I did make it with store bought buttermilk the other day (using the recipe from The Home Creamery) and it was delicious.